Showing search results for Accepting Your Imperfections Quotes, Quotations & Sayings 2019. 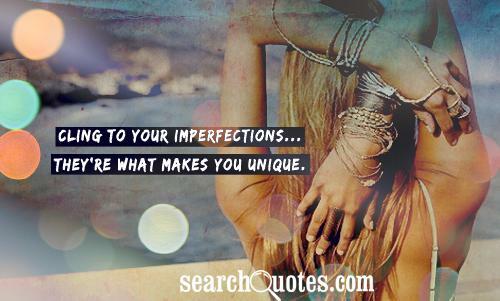 Cling to your imperfections...They're what makes you unique. Hey you. Yes you. Stop being unhappy with yourself. You are perfect. Stop wishing you liked someone else, or wishing people liked you as much as they like someone else. Stop trying to get attention from those who hurt you. Stop hating your body, your face, your personality, your quirks. Love them. Without those things you wouldn't be you. And, why would you want to be anyone els? Be confident with who you are. Smile. It'll draw people in. If anyone hates on you because you are happy with yourself, then you stick your middle finger in the air, and say screw it! Your happiness will not, be depended on anyone anymore. Life is too short to be perfect. 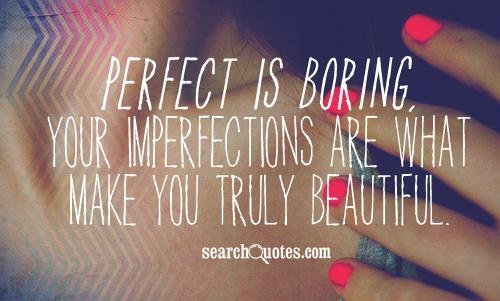 Love your imperfections, they make you, you. And, your flaws is what make you beautiful. So, be you. Because, you, are pretty amazing. Keep in mind that I would never judge you for any of your imperfections, they simply make me love you more. Your imperfections make you perfect, your insecurities make you secure, but your flaws...They make you flawless. There is no such thing as the perfect human. All humans are imperfect whether they/we like it or not, but it is not something to sulk about. Not only will no one like you because you sulk about your imperfections, your mistakes, but more importantly it is our imperfections that make us, us: human. Those imperfections teach us about ourselves and the mistakes we make in life will teach us how to be a more better human being. And those who let their mistakes teach them and not rule them are one step closer to becoming the perfect them. Don't make yourself perfect for someone to love you... just wait for someone who loves your Imperfections. I love you today like I loved you when we met. I will love you tomorrow and forever, simply because you are who you are and your imperfections are perfect to me.